LMU physicists investigating spontaneous pattern formation in a model system that includes motile proteins have discovered hitherto unobserved phenomena. Their findings afford new insights into biological processes. Bird flocks and bacterial suspensions, but also the dynamic filamentous protein systems that make up the cytoskeleton of eukaryotic cells, have something in common. From the physicist’s point of view, these are all examples of active matter, i.e. systems whose components are capable of converting chemical energy into active motion. How these components self-organize into functional assemblies is one of the central problems in cell biology, because many of the essential processes that take place in cells are based on the self-organization of complex molecular structures into patterns. In collaboration with Professor Andreas Bausch at the Technical University of Munich, LMU physicists led by Professor Erwin Frey have studied a popular model system for active matter, and discovered phenomena never before observed. First of all, the researchers found that distinct patterns can emerge under the same starting conditions and, furthermore, these ordered states can dynamically coexist with one another. Secondly, subtle fluctuations on the microscopic level do not die away. Instead they can have significant consequences for the whole system at the macroscopic level. The new study appears in the journal Science. Frey and his colleagues used a standard motility assay as their model. In this system, myosin motor proteins are attached to a substrate to form a kind of carpet. Then a solution containing filamentous polymers of the protein actin in added. In the presence of a chemical energy source (ATP), the filaments bind to the motor proteins and are actively transported within the array. 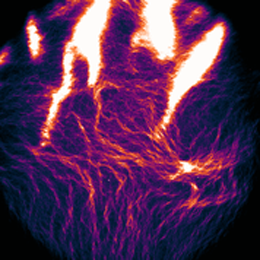 “Under standard conditions, the actin filaments move in wave-like clusters,” says Lorenz Huber, a doctoral student in Frey’s group and, together with Ryo Suzuki and Timo Krüger, joint first author of the paper. Experiments performed in Bausch‘s laboratory showed, however, that minor alterations in the interactions between the proteins have an unexpected effect on this pattern. Addition of a small amount of the organic polymer polyethylene glycol to the system effectively reduces the volume available to the actin filaments. Under these conditions, not only the frequency, but also the type of interactions observed changes markedly, and the advancing wave fronts are transformed into thread-like forms that grow in length, rather like ant trails. This demonstrates that even minor, local modifications can drastically alter the behavior of the system at the macroscopic level. “Normally, one assumes that the tiny details become insignificant at larger scales – but here, small differences are progressively amplified and have an ever-larger impact as one increases the scale of the system,” says Huber. The researchers went on to develop a theoretical model that captures the motions of the filaments and reproduces the experimental observations. Simulations based on this model also revealed a region of parameter space in which both wave-like structures and ant-trails emerge simultaneously – and can stably coexist with each other. “This emergence of bistability indicates that we have identified a new phase of matter,” says Frey. In further laboratory experiments, the team was in fact able to generate both states of organization at once. “It is really fascinating to watch. The polarized waves wash over the ant-trails and virtually wipe them out, leaving behind a kind of moraine, which serves to seed the formation of a new ant-trail. So the system exhibits a very interesting and dynamic interaction between the two types of pattern,” says Huber. These findings indicate that active matter systems have a unique capacity to give rise to different sorts of dynamic patterns under identical starting conditions. According to the study’s authors, this insight has profound implications for various fields of research, and could lead to new ways of understanding biological processes. “It inspires one to reflect on how a biological system can simultaneously generate different types of order using a given set of components,” Huber concludes.